Neuss, Germany, 2nd September 2010 – Toshiba Europe GmbH today introduced its new media tablet FOLIO 100. The 25.7cm / 10.1'' personal media tablet is targeted at people looking for a 100% portable and versatile device that is always at hand for making the most of their digital life. The FOLIO 100 comes with a wide selection of apps and services dedicated to media consumption, web browsing and social networking, and offers a rich multimedia experience. Easy and enjoyable to use, the FOLIO 100 has a highly intuitive graphical interface developed by Toshiba to run on top of Android 2.2 (Froyo). The FOLIO 100 will be available during the fourth quarter of 2010 throughout Europe, Middle East and Africa. "Our FOLIO 100 media tablet offers a seamless, easy-to-use experience across entertainment, social networking and mobile internet – anytime and anywhere", said Marco Perino, General Manager Digital Life Products and Services. Offering a wide range of connectivity options, the FOLIO 100 is equipped with an SD card slot, an HDMI® connector, USB 2.0, Wi-Fi® and Bluetooth®, while a Mobile Broadband (3G) ready version will follow soon. The FOLIO 100 ships with a wide selection of applications pre- installed: amongst them Opera Mobile (web browser), FBReader (e- book reader), Document To Go® (office suite), Evernote® (notes), Adobe® Flash 10.1 and Fring®, an app that in combination with the embedded webcam allows video calls with friends and family. 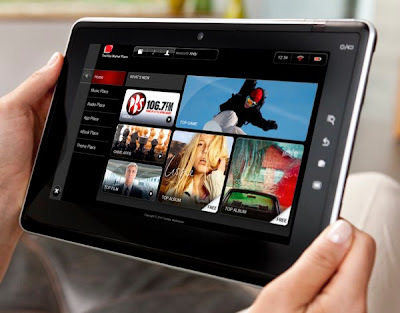 The media tablet also features Toshiba Market Place, a service that offers easy access to various download choices for multimedia content, services and apps. Music Place, powered by 7Digital offers easy access to one of the widest catalogues of music and allows easy syncing to a choice of devices. Radio Place gives access to a wide selection of IP radio services. Through the App Place, users are able to download applications compatible to the Folio 100. Although it is only 14mm slim and weighs only 760g, the FOLIO 100 still packs a powerful Nvidia® TegraTM 2 processor that offers a perfect balance between high performance and low battery consumption. A battery life of up to seven hours1 lets the tablet work for almost a full working day without the need of a power outlet. The instant-on functionality lets the tablet be operational within less than 30 seconds. A 16GB on-board storage hosts music, videos, photos, e- mails and other data and is even expandable via SD card. "We encourage users and developers to join our Folio 100 eco system to create and offer apps, games and other content for FOLIO 100", said Marco Perino. Toshiba already established a one-stop destination (www.toshibatouch.eu) for developers where they can get support to optimise their apps for the FOLIO100. "We also invite users to participate in the FOLIO community by suggesting ideas to developers to pursue," said Marco Perino.